Are you enjoying this winter? Uh it’s really getting tough for me to wake up in the morning, coming out of the cosy blanket! No option but to move on (Thank God, Pune is not that cold place). As compared to my facial skin, body skin is much dry and as usual during winter, it gets over dry. Like I mentioned in my previous winter care post part 1, that cold season is double trouble for dry skin beauties that includes me also! Thankfully, Nature’s co sent their body butter and face cream in their November Beauty Box to me and I took full advantage of them. Thus am sharing my views on these right away. 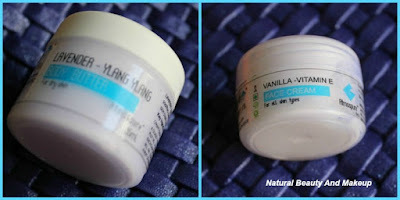 Today I am going to review TNC Lavender – Ylang-Ylang body butter & Vanilla Vitamin E Face cream from Atmospure range, which are the sample products of my November Beauty Box 2015. Keep reading to know more about it. Body Butter- Luxurious; Sensuous moisturizer; Fresh clean scent of Lavender; Softens, heals and protects dry skin, while Ylang-Ylang normalizes and soothes over-dry skin. Enriched with vitamin E, this body butter will bring back your skin’s lost suppleness. Face Cream – Gives you a youthful glow; keeps skin soft, supple and firm; Enhance blood circulation in your face and restore freshness. Claims: Enriched with Vitamin E, this body butter claims to bring back the dry skin’s lost suppleness. Whereas enriched with natural oils, vitamins and butters, vanilla vitamin E face cream enhance blood circulation in your face and restore freshness by lightening dark spots and reversing the signs of ageing. 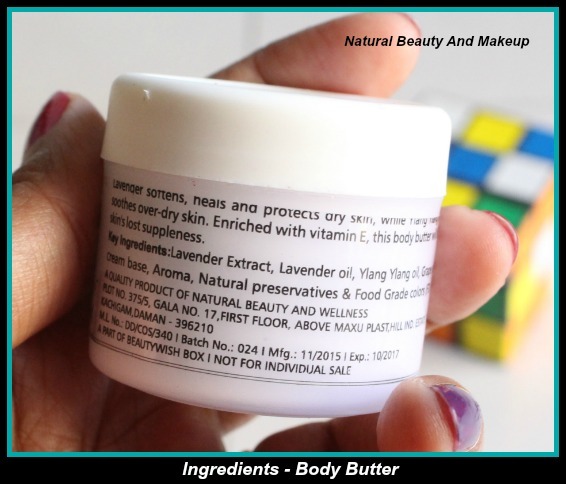 How to use: Massage slowly the body butter onto the skin, allowing your skin to absorb the nutrients. Reapply as needed to rough or chapped areas. 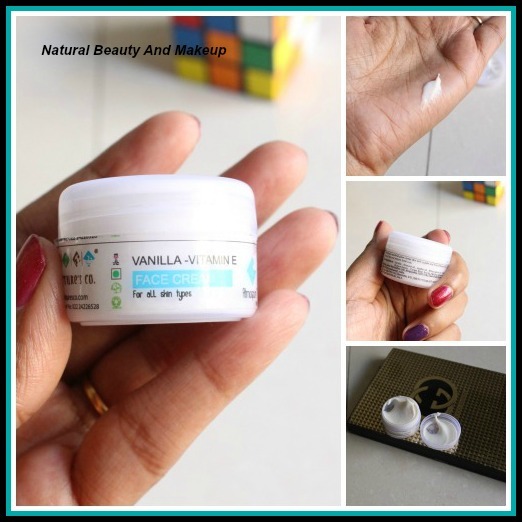 Smooth a small amount of Vanilla Face cream over clear, toned skin as needed, using gentle upward strokes. My expectation was higher with this body butter but sad it did not turn out that great what I anticipated. It has a creamy texture with thick consistency and comes in a small regular sized tub packaging. One thing which I felt is, when applied on a damp skin it gets absorbed fast but on a complete dry skin it’s hard to apply sometimes. Though it made my dry, undernourished skin soft and supple but to achieve that I had to apply this butter multiple times a day onto my skin. Now summing up the pros and cons, I would say it’s a good body butter which is perfect for dry, cold season but I do not think this would be apt for summer time when the weather is warm and humid. Well my dry skin didn’t feel the stickiness but oily skin beauties may feel this a bit greasy on their skin. 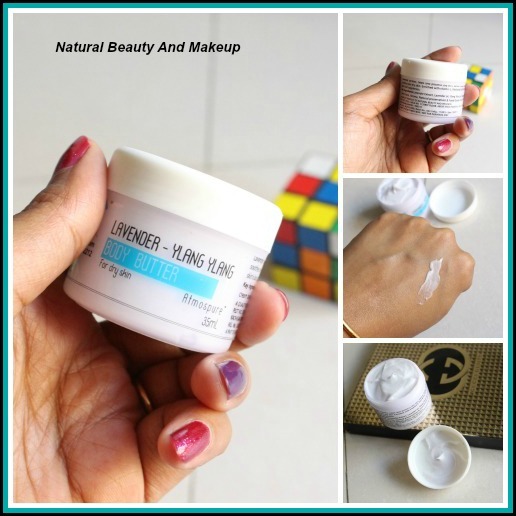 As per its claim, this body butter is enriched with Vitamin E which will bring back skin’s lost suppleness and this is true to a great extent. Has a pleasant lavender fragrance but somehow it reminds me of boroline cream! Sensitive noses may find it strong. Another amazing product I got from my beauty box. I was so excited to try this variant Vanilla on my face, which I have never tried before. Anyways, this face cream comes in a cute rectangular tub type packaging (I got another sample variant though), with full details printed on the body itself. It has a soft, creamy, buttery texture, milky white in colour and the consistency is neither thick nor thin. This has a heavenly smell, which I totally adore. I need to apply only a pea size amount of this cream on my face and it melts like charm! There is no hassle in application even on a complete dry skin. After each application I felt my skin soft, firm, supple and radiant. In addition to these, it’s true to its claim to some extent. Like this cream helped in fading few dark spots on my cheeks but can’t say about reverse ageing claim! Moreover this is for all skin types, a big plus! Well I found it so good that am going to purchase a full size of this very soon. It’s cute, travel friendly and superb, found no negative thing as of now. In short, I had a good experience with this face cream and body butter. So I would like to request everyone to give them a shot, especially dry skin beauties. The only con of these two which I felt is tub packaging system; I hope Nature’s Co will come up with tube format for these products next time considering the hygiene factor. Have You Tried The Nature’s Co Lavender Ylang Ylang Body Butter And Vanilla Vitamin E Face Cream? What Is Your Experience, Do Share With Me In The Comment Section Below. Both the products sound really good. 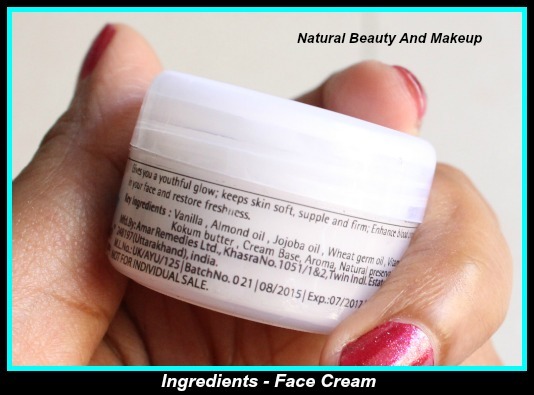 I have used Nature's Co Foot cream and lip scrub and I love both the products. 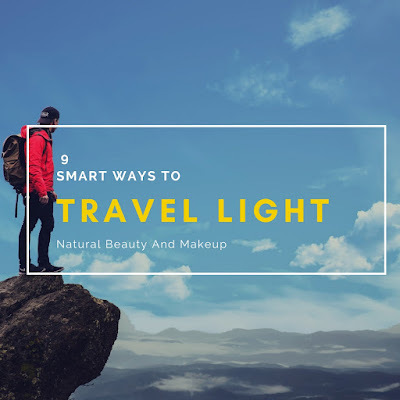 Nature's has good skincare. The only thing I am concerned about is why it says only key ingredients. I can understand your point dear, but so far as I know they use only natural things and are paraben type chemicals free! So am little bit relaxed on this part, still I agree with you. They should mention full ingredients list on the product.